Fulfill your child's wish for fun-filled sleepovers and gain generous storage space in the process. This twin bunk bed with storage makes for a playful youth bedroom that's kid friendly yet chock full of grown up appeal. This useful youth bed comes in a classic shape that kids love, and parents can't help but admire the added storage capacity offered by the under bed storage unit with drawers. 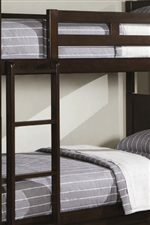 Lines on the horizontal guard rail and vertical ladder add contemporary appeal to the otherwise casual look of the bunk bed's frame. A coordinating night stand, chest and dresser with mirror continue the clean lines and casual design of the collection and add even more functionality to your home. The Jasper Twin Bunk Bed with Under Bed Storage Drawers by Coaster at Value City Furniture in the New Jersey, NJ, Staten Island, Hoboken area. Product availability may vary. Contact us for the most current availability on this product. 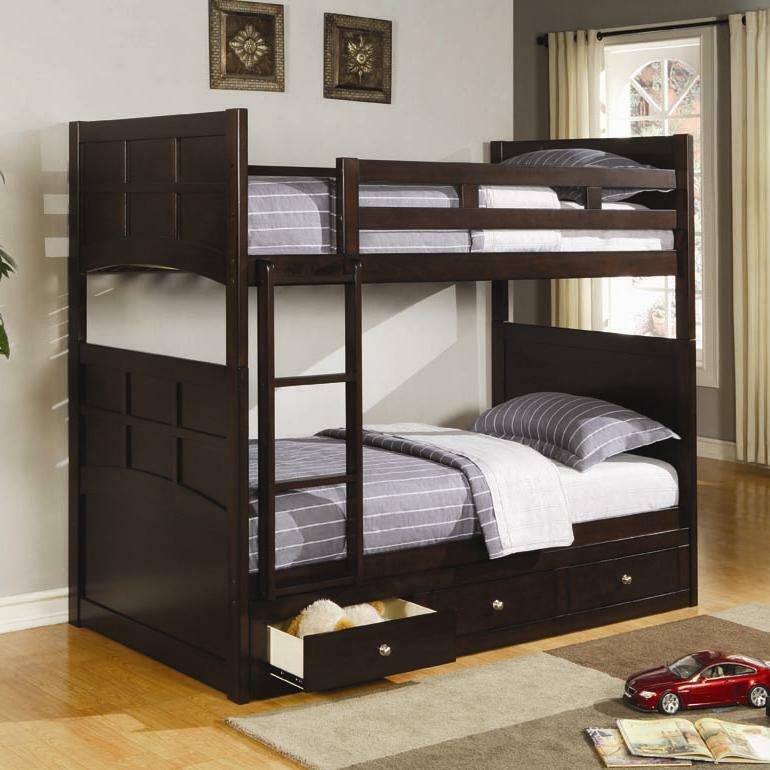 460136 Twin Bunk Bed 1 44" 79.25" 67.5"
460137 Under Bed Storage 1 74" 20" 9"
Finish Bathed in a dark brown cappuccino finish. Finish & Paint Options Rich cappuccino finish. Handles & Hardware Polished nickel look knobs. Case Detail Simple bracket feet anchor cases. Drawer / Shelf Construction Spacious drawers with full extension drawer glides. Drawer Suspension Full extension drawer glides for maximum storage capacity. Description: Top Smooth, flat case surfaces for storing or displaying. Who says you have to sacrifice style when searching for a suitable youth bedroom set? Truly versatile kids' furniture will appeal to youngsters while maintaining a stylish yet functional look and feel that will grow right along with them. Fortunately, the fluid lines, enhanced storage capabilities and casual design of the Jasper youth bedroom collection do just that. A traditional twin size bed includes under bed storage space and can be exchanged for a full should the need arise. A twin over twin bunk bed comes in a classic shape that kids love, and parents can't help but admire the added storage capacity offered by the under bed storage unit with drawers. A coordinating night stand, chest and dresser with mirror continue the clean lines and casual design of the collection and add even more functionality to your home. Each piece is wrapped in a rich, low gloss cappuccino finish and topped with polished nickel look hardware for just a hint of shine. Choose the Jasper collection for a playful bedroom set that's kid friendly yet chock full of grown up appeal! The Jasper collection is a great option if you are looking for Casual furniture in the New Jersey, NJ, Staten Island, Hoboken area.